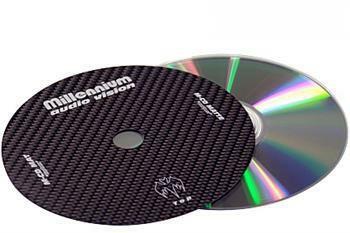 Like the LP mat, Millennium's M-CD damper is only .3 mm thick (with no fabric backing). That thinness makes it suitable for use in virtually any transport, top- or front-loading. I first heard about it when an audio buddy raved about how much it had helped his Metronome player. For a couple of years I had been using the Marigo damping disc, a lightweight device made of treated (with what I don't know) stiff paper. But the improvement with the Millennium was immediately apparent, and most exciting. With every disc, regardless of musical genre or age of the recording, the M-CD damper improved the sound. Deeper and more precise bass was most immediately noticeable, but it didn't take long to perceive a more organized and coherent spatial presentation and more beautiful tonality on voices and instruments — and, importantly, a wider, less compressed dynamic range. This thing has benefits beyond simple disc playback. Because it is so thin, I can use it when ripping a disc onto my iMac and burning CDs from the computer. For instance, I ripped the Ivan Fischer Mahler Fourth — a wonderful-sounding SACD that was one of my 2009 Blue Note Award choices — onto the iMac, and burned a Redbook (16/44) CD of it. Comparative playback over my Modwright/Denon player was fascinating. I had previously ripped and burned the same performance before receiving the Millennium damper, and had found that the copy I burned from the iMac, though Red Book rather than SACD, was very close in sound to the SACD layer of the original disc. With the new Millennium-aided copy, or when playing the performance from the iMac through a USB DAC, there were only fairly inconsequential differences between the original and the ripped or burned versions — except that here and there I thought the copies sounded a little better! HIGHLY recommended — but let me emphasize that for ripping/burning discs, I've used it only on my iMac. For any other computer, proceed at your own risk.